ICS Alum Shannon DiStefano’s PYP play First They Came For (which she wrote as an 8th grader at ICS) will be performed on stage February 10, 11, & 12. We are so very proud of her work and our partnership with PYP. Find complete info, and buy tickets here! Our 7th & 8th graders had an incredible National History Day event last Thursday. National History Day represents the culmination of a great deal of hard work and learning over students’ careers at ICS. Every student masters a topic and speaks to it with their own historical voice. The projects take teamwork and force students out of their comfort zones as they present to judges what they’ve learned and the lessons history can teach us today. The top projects from ICS will be selected to compete in the upcoming citywide competition! We will share more information (and some links to projects!) over the next few weeks. Luz Marina’s 1st graders put together supplies for care packages for the U.S. military through Operation Gratitude. Below is a photo of a soldier receiving his care package! The 2015-16 School Progress Reports from the District have been released, and ICS is proud of our progress. Due to our growth, climate, and overall achievement, we have been named one of top 12 “Model Schools” in the city by the District! Congratulations to this year’s Super Bowl Raffle winner: Naomi Mendelsohn, mom of Harry Ricci in 1st grade! The 5th grade team sends a big thank you to everyone who participated and supported the 5th grade camping trip. February’s PTA Meeting will be combined with Counselor Anne’s annual High School Info Night. We especially invite 7th grade families to this night, but we welcome all ICS families who are interested in learning more about the high school application process in Philadelphia. ICS is hosting our fourth annual Middle School Career Day on Friday, March 10th from 8:30-10:45am. We’ve recruited many volunteers, but I need more! Do you know someone who is interested in sharing information about their career? Someone who wants to give a couple hours of time to our school & students? All careers are welcome – I’d love to host some small business owners, hair stylists, computer engineers, bakers, physical therapist, dancers & trade specialists (electrician, plumber, carpenter)! These are careers that ICS students have expressed interest in. ICS Odyssey of the Mind T-shirts are available for order online in the school store. Support ICS Odyssey with the purchase of a cool t-shirt that shows school spirit. These spirit shirts can be worn on Fridays! You can support Take Flight in so many different ways! Donate to the EdBacker campaign. Date night happy hour at Ambrosia Kitchen and/or PJ Party (babysitting) at ICS on Friday, February 10 – Full details and tickets at EventBrite (with new ticket price for happy hour just $35)! 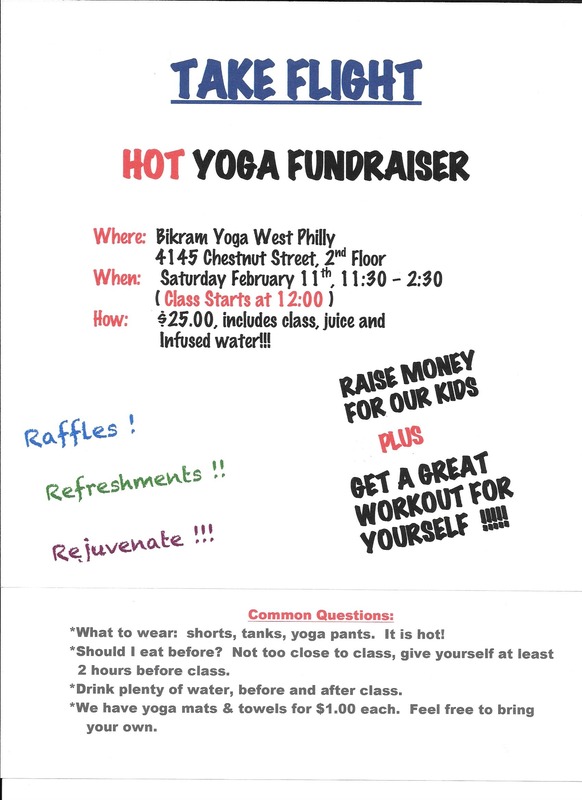 Join the Bikram Yoga Fundraiser on Saturday, February 11 from 11:30-2:30. RSVP to eisensteins@yahoo.com to reserve your space! The Aquinas Center is a community center in South Philly that serves immigrant families. They are looking for folks to create signs of support on 8 1/2 x 11 paper. The goal is to paper the first floor hallway with messages of hope and support for the nearly 550 immigrants and refugees who walk through the door each week. Many families are Spanish speaking, and so Spanish messages are also welcome (or other languages if students are multilingual). You can bring messages directly to the center, or send them to ICS and we’ll make sure they get delivered. The Pennsylvania Ballet will be doing a sensory friendly performance of The Jungle Book – Saturday, February 25, 2017 – 11:00 AM – Sensory Friendly Performance – Prince Theater – 1412 Chestnut Street, Philadelphia, PA 19102 – Sensory friendly performances are designed to create a welcoming environment for families with children who are on the autism spectrum, may have sensory sensitivities, and anyone who may benefit being in a more relaxed environment. More info and tickets here! Is your middle-schooler looking for books about social justice with an empowering global perspective? Check out this recommended reading list from Barnes & Noble. Violin Classes at Tenth Church – New Session starting February 8th! – Affordable beginning/intermediate violin classes are being offered to all interested 7 to 17 year-old students in the area. The classes are taught by Judy Harvey, Cheltenham Township School District strings teacher and Eric Jones, Philadelphia School District strings teacher. For more information go to www.tenth.org/violin or contact Judy Harvey atjharvey@tenth.org. Mayor Kenney’s office has put together a list of special events happening this month throughout Philadelphia in honor of Black History Month. They will continue to add to it, so check back frequently!